Congrats to FraggleRocker for the winning entry and 50 duck prize. Thanks to everyone who entered and voted! Here are the final results of the Caption this drawing caption contest. "Witness protection undergoes budget cuts"
I've got this contest in the bag. Sentient bag digests man. Is pleased. Sha na na na na na na na na Bagman! Congratulations! Your PLANK has evolved! There's no masking your inner child. Why is there a man in my lunch bag...? He's frowning on the inside. My anonymity pleases me greatly. HA HA HA! No one will know I am Poeticy! New look from Cover Girl. Snake, I know that is you! You have selected: Bachelor Number One!! There- I've stopped sparkling... Happy? Hello, I'm a Chiefs fan. The cannibal wanted a sack lunch. The only way to contain my awesomeness! This is how I face the world. No more mistaken identity for Corvax. Under every smile, hides a dark secret. This IS my face! Yes, I eat through it! I draw smileys on bags to hide the pain. I have a pimple...it's bad. The mouth looks like a nose. unsee that! Ah, the joy of anonymity. Papa's got a brand new bag.. Woop! Woop! I cut eyeholes...but have no eyes? Hypoxia never looked this good! What to wear when the world ends. Can't see a thing! Help find my glasses? Paperbag Princess, your doing it wrong. No one here but us smiley paper bags! I'M UGLY AND I'M PROUD! It's a good day for Ugly Bob. Johnny from EE&E wants to become Plank. Superhero's Sidekick, Paper Bag Boy! I swear, this IS my real face!!! a bag over my head makes me happy. Hey kids! It's me, Mr. Paper-Bag Head! I remember to cut holes first this time! 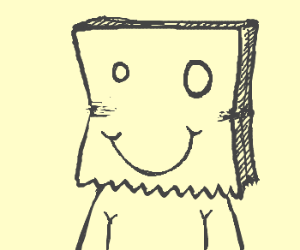 Dress up a corpse w/ "Smiling Paper Bag"
Oh boy ! I'm soo hidden now ! Hey! It's Mr. Paper-Bag Head! Who said "Mattress" to Mr. Lambert? Paperbag Man! King of the bums. I'll be happy to help, Sir!